What is the policy regarding flags on comments in chat rooms? Each comment in The Base Camp chat room has a flag beside it. Hovering over it says "flag this message as spam, inappropriate or offensive." I have a few questions about that flag and its implications. If it's selected, is there another step? For instance, does it offer a choice of reason before reporting it? 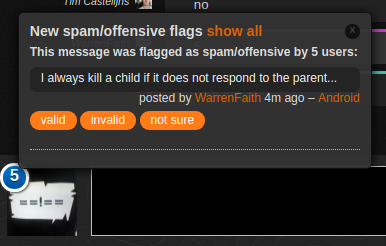 Is there a message asking to confirm that you want to flag it? One reason I'm asking that is because many times I've almost flagged a post by accident because the flag is so close to the star. If I had hit a flag, and another choice came up, I could have changed my mind before anyone knew I did it! Does it go into a queue to be reviewed by the moderators? If so, how many moderator votes are necessary to make a determination? Does the person who flagged it get any notification as to the outcome? If someone receives a certain number of flagged comments, are they penalized? If so, what's the penalty? If someone raises a certain number of flags that the moderators feel are unjustified, are they penalized? If so, what's the penalty? If someone feels their comments have been unfairly flagged, what course of action should they take? I think the meta guide: A guide to moderating chat is very good. One thing it does not touched on, nor does your question, is who should flag. In my experience, each chat room has its own style. While the general terms of the CoC need to be upheld, there is a fair amount of leeway. For example, some chat rooms allow off topic discussions others don't; some allow profanity and others don't. If you enter a chat room for the first time and see colorful language, you may not want to immediately start flagging everything. If a new user comes into a room you are a regular in and starts cussing like a sailor, you may want to tell the user to tone it down and flag the content. In general, if you are finding lots of stuff to flag by a lot of users, it may not be the right chat room for you. If there is a single problematic user, you should definitely flag away. If an otherwise well behaved user says something bad, flag it (or tell the user how you feel). Short answer is they don't. They show up void of context and really are less than useful. This normally isn't a problem here. Not the answer you're looking for? Browse other questions tagged support chat flagging . What should we name our chat room? Large banner to encouraging people to visit chat rooms during Beta. Are we more disciplined here than at StackOverflow? Or Are we a bit ignorant here when flagging comments? Is it okay for a user to link to a different person's profile, if they already have a post on the page? What's the procedure for having an answer converted to a comment? What should I do when a new user posts a lot of low quality, late answers to old questions, at the same time? If users vote to close the same question for different reasons, which reason appears when it closes?